Sukka masala ribs prepared with coconut masala and spices. You can serve this with rotis or enjoy like a snack too. Lemon juice ... 1 tbsp. Dry roast and grind the following ingredients. 1. In a pressure cooker boil the ribs adding black cardamom, cinnamon and salt until almost cooked. 2. In a pan heat a little oil and add the sliced onions. Saute until pink in colour. 3. Add the crushed garlic and ginger. Saute. 4. Tip in the ribs and saute for a minute or two. 5. Add the dry ground masala and turmeric powder. Check the salt and add a little, as we had boiled the ribs with salt. 6. Fry until the masala is coated well and the oil starts separating. 7. Squeeze a little lime juice. Garnish with fresh coriander leaves. You can enjoy these masala ribs as a snack or serve with rotis and naans. 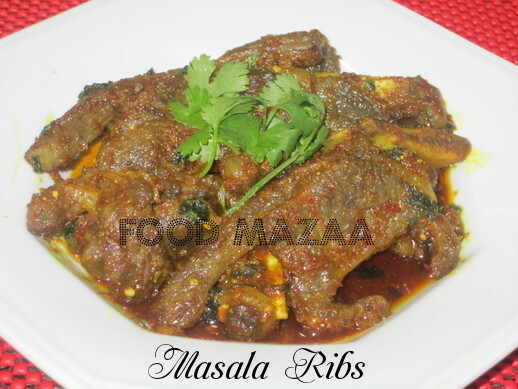 Masala Ribs Looks so delicious !! Love your idea of giving coconuty flavor to this meat recipe. Wat a fantastic,flavourful and fingerlicking ribs.